Historically marijuana cultivation on tribal land was seldom. Cannabis Indica grew wildly and there was no need for them to grow mass amounts when, depending on where they were, they could gather and collect what they needed. Natives in early (written) documented years used marijuana for ceremonial and medicinal purposes. When smoking cannabis, which not all tribes did, they viewed this as way to connect with their Creator. Just like any ceremony conducted, Natives would use specific pipes to inhale the smoke. These pipes were seen as living beings and spirits, making the act a very personal ritual. The late 1800s roll around and the USA now makes each tribe become federated and divi up the land they once roamed according to weather and food cycles. Now Sovereign Nations, each tribe has their own form of government called Council. One act of the Council is to bring forth a new law and oversee the passing of any law pertaining to their trusted land. To begin selling or cultivating cannabis, each tribal member must vote a majority to legalize the act. Even today, cannabis is legal in the state of Washington, but unless the tribe you have entered has legalized the substance, and very few have, you would then face a federal offense. The Nisqually Indian Tribe, a tribe located in the state of Washington near Olympia, is where I met with a tribal member, Monty Sison, and the heads of their economic department, Cynthia Iyall and Bob Iyall (sister and brother), to discuss their plan in the coming years and/or if they even had one. 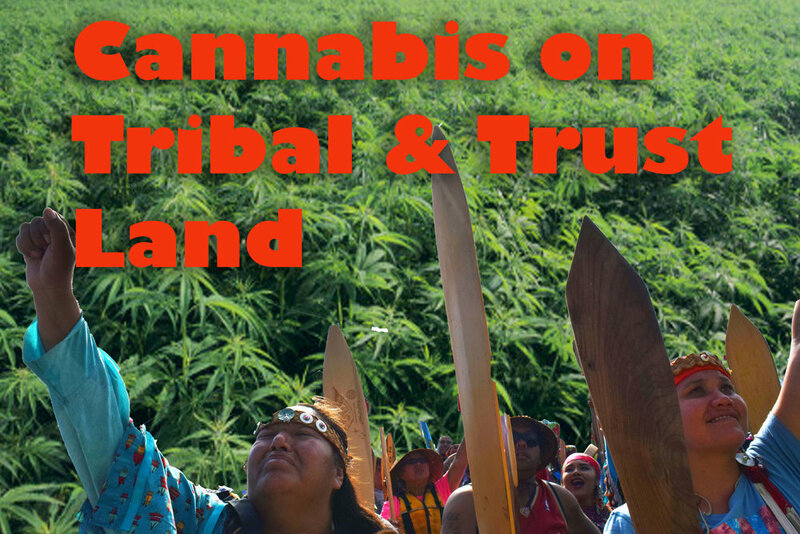 Some tribal members have begun to make those first crucial steps in legalizing the plant by sending out a survey to each of the 900+ members. After analyzing the responses, about 80% of the tribe has said they are in favor of legalizing and getting involved in the cannabis industry, while the other 20% says no. Can you guess who the 20% are? Elders traditionally have a lot of say in the tribal community. They are held to the highest regard, and their thoughts and opinions on matters are taken very seriously when deciding the future of their youth. Many of the elders today are from a time when the US government was putting the most money into propaganda, highlighting the (speculative) negative effects the plant holds in society. Many of these elders have also lost many friends and family members to substance abuse stemming from generational trauma, causing them to perceive the legalization of cannabis as a clear way of promoting a drug to Native youth. Cynthia and Bob both stated that they will put the time and effort into planning as soon as the tribe votes and passes the legislation. Until then, they both have other economic opportunities to focus on. Both shared a concern over recent letters from Jeff Sessions to the heads of the state, claiming they are in route for a crackdown from the DEA. One Nation that is visible in the press for jumping in the game a little too quickly, and still has a court case pending against them, is the Flandreau Sioux Tribe in Sioux Falls, South Dakota. And yes, this is a federation of the same tribe that fought for their water rights at Standing Rock this past year. The Sioux tribe had high hopes (no pun intended) to have the first ever Cannabis adult resort. There, you would be able to stay at the five-star hotel, smoke amazing ganja, and all the while be immersed in the divinity of the first nations culture. The tribe immediately held a Council meeting after the release of The Cole Memo, voted to legalize, and began breaking ground for a massive grow operation. Yes, the tribe did the right thing by legalizing cannabis on tribal land but what they failed to work with was that fact that cannabis was/is still illegal in South Dakota, making it still illegal for anyone, Native or non-Native, to buy any type of cannabis products and leave reservation or trusted land, or participate in resort or lounge activities and drive home intoxicated afterwards. Should anyone be stopped by police after doing so, they would face charges with the state of South Dakota, which would also be fronting the bill (via tax dollars) for jail/court. Time for another valuable lesson on the policies, politics, and history surrounding cannabis in the west. This book report comes from one of Stoney SPICE's papers for her college class, The Business of Cannbis. Read below for her partial assessment of Cannabis: a history by Martin Booth and cannabis's legal history in the USA. Cannabis: A History took me through a world that I had not realized existed. Sure, I knew that cannabis had been around in many cultures for many, many years. But little did I know the plant, solely used as a commodity, had such value to nations, particularly the U.S. That being said, I found it very interesting to learn the ins and outs of Britain’s forced trade with the New World settlers that began with a fiber better known as hemp. When the colonizers ventured to the 'New World', Britain was at the time a major producer of hemp...or at least they were trying to be. Because hemp grew wild in so many places throughout southern Europe, it made it almost impossible to regulate a trade within the country and charge people when they could go gather what they needed in the hills themselves. But what about trading with the settlers in what was soon to be the United States? For hemp was not as abundant to them just yet. Or, what about forcing the new settlers to grow the hemp, ship it back to Britain for processing, and then ship the finished goods back to the settlers and sell it to them? Perfect! During the 15th century hemp was not commonly used for medical or recreational use by the settlers, but to make thread, rope, cloth, paper, and food. This made hemp an important commodity worth the struggle and man power to produce. Colonies that were in Maryland and Virginia were known to be the main producers of hemp. Cannabis Indica being known for more temperate climates was more popular in these areas, but the settlers surprisingly enough grew Cannabis Sativa, making them responsible for introducing her to these areas. Talk about the recreational use of cannabis amongst the colonizers is still up for debate. Though many of the 'founding fathers' were known to grow the plant, rumors float around historians' mouths that George Washington, being a hemp farmer dabbled for pleasure, as well did Thomas Jefferson ( though if true, it seems the plant had no effect on their moral conscious as both were devoted slave owners). But that doesn’t change the fact that hemp is still thought to have been grown strictly for trade and the widespread use of the fiber. If settlers during this time period were looking to use a mind-altering substance, they were more likely to use opium before consuming the resin that the female plants produced. Cannabis: A History has done an excellent job of opening my mind to the history of hemp and cannabis in the west. Taking me on a journey through time and explaining the importance of cannabis/hemp to cultures around the world, I'm finding that this book is a must read for any doubter of the impact this plant has and has had on the world today.